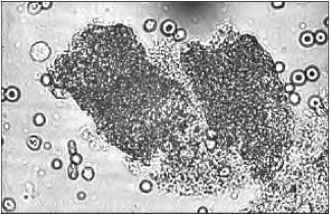 Urine sediment of a patient with acute renal failure revealing red blood cells and some red blood cell casts (original magnification X 600). Biopsy in this case revealed crescentic glomerulonephritis. However, hematuria may be seen in any proliferative glomerulonephritis or with parenchymal infarcts. The "casts" assume the cylindrical shape of the renal tubules, and confirm an intrarenal source of the blood in the urine. Fragmented or dysmorphic red blood cells may be seen when the red cells have traversed through damaged glomerular capillaries.